ANYWAYS… my favorite resident of the night was one who came downstairs specifically to grab some lollipops. He decided that he wanted to get the mystery flavor, but feared what flavor he would get. I told him to close his eyes and pick, he did so, and let me tell you it was so funny! He closed his eyes and lightly caressed each lollipop until he found the perfect one. He opened the wrapper and it was a beige colored pop. With excitement he tried it and when we asked the flavor his answer was ” I honestly do not know…I think I smoke too much that my taste-buds are shot.” SO MUCH FOR THAT!!! Speaking of funny quotes, another resident said his lollipop tasted like strawberries and vodka. HAHAH… the officer with me turns to me after the resident leaves and says the strawberry is the pop, the vodka, what he must be drinking. GOOD TIMES ON FRIDAY NIGHT!!! 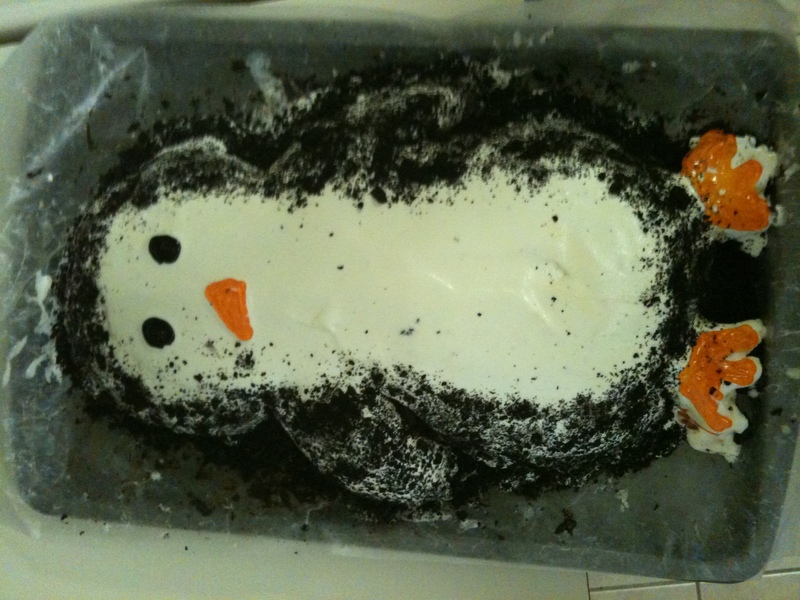 To end this happy post, here is a picture of the penguin ice cream cake I made yesterday!